I thought I’d write up a little article to address a particular issue I’ve been experiencing on several of my blogs. The problem; spam! 90% of people are going about blog commenting for traffic all the wrong way. If your using any of these lame methods you’re wasting your time and more importantly your wasting the blog owners time, the comment will be deleted or flagged as spam and you get nothing! Blog commenting for free traffic is about the quality not the quantity, you can post a 1000 comments and maybe one will stick (won’t get deleted) using the those lame spammer methods. Or you can write 1 comment and get it to stick. Thats a 100% stick/success rate. Lots of wordpress blogs on the subject of free traffic. Note: It does not matter what PR (pagerank) the site is or if its no-follow, what’s most important is that its relevant to your website and active (at least one new post per month). Read through the articles and find one that interesting to you and ideally related to your website on a specific level, you don’t have to read every single part of the article but read at least enough to understand what the article is about. If you can’t find anything interesting articles move onto another blog, other people will be doing the same and so there’s no point commenting here. You’ve found your target and its time for you to comment. Does article already have comments? Is the comment thread active? Is there a discussion you can join in? Joining in and sharing your thoughts is the primary purpose of blog commenting and you should try to get involved when you can. Important, please pay attention to this part or all your hard will go down the drain. [Name] So enter your REAL name, not ugg boots, not low rate loans, not cheap holidays. Entering your real name or even a pen name instantly add credibility to your comment. [Email] I recommend you add in your real email here and check the subscribe to comments if the option exists, this allows you to be notified of update to the comments area and allows you to come back and engage the other users. [Comment] Okay, the most important part of your comment. Your comment should be a direct response to the article your commenting on as a response to the on going discussion in the comments area. You can and only if its appropriate add a link to your website. For example if someone asked when can I get XYZ cheap? then it would be okay to suggest a website. You must respond to the content or the discussion and it also helps a great deal to refer to a part of the article, as this proves that you actually read it. After you have posted your comment it may take a few hours or even a few days to be approved, when you leave your comment make sure you tick the subscribe to comments if the option is available. Bookmark the article and check back in a few days and see it your comment was approved, if it was your free to write more comments on this blog in the same manner as before. Subscribe to the RSS feed of the blog, this way you’ll get notified when new articles are added. This gives you a chance to comment early and this means lots of eye balls reading your comment. I hope people use this strategy to great effect, focus on the quality and I promise you’ll see results. P.P.S Please leave your comments below, using what I told you above. Just for fun I’ll update this post in a week with all the spammy comments from people that are blog commenting the wrong way. You now have the skills, do it the right way. After 5 minutes of this post going live we have a spammer, and this spammer claims to teach SEO! Don’t ever Ever comment like this. Can you guess what button I’m going to press? 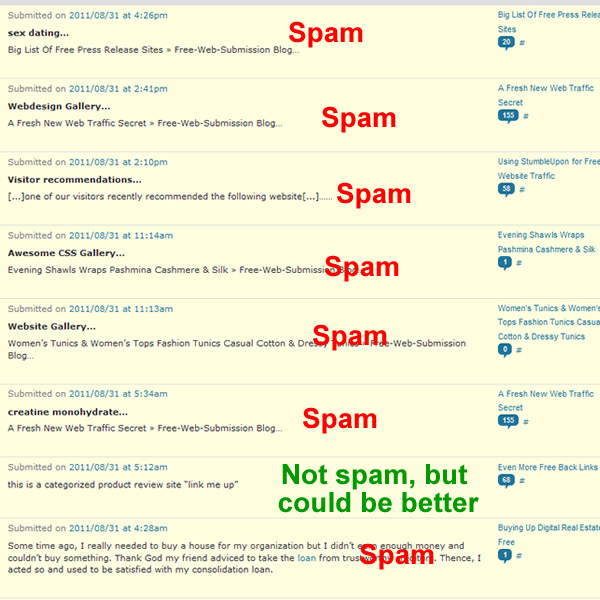 Oh and just for the record I have most spam filtering plugins turned off to provide good spam examples. I’ll write another post in the near future on what plugins you can use to prevent comment spam.